How Does IQF Technique Work? The IQF freezer uses either Liquid Nitrogen or Cryogenic Carbon Dioxide gas to lock-in the moisture, shape as well as freshness of fruits and vegetables. Liquid Nitrogen: In this case, either the fruits of vegetables are placed in an immersion of liquid nitrogen at a temperature of minus 1960 Celsius or it is applied to them while they are in motion. IQF with liquid nitrogen is also used with sauce coated products or in case if the water content is quite high. Freezing with Cryogenic: IQF with Cryogenic Freezing freezes liquid or moisture into pellets and coatings. Either the cryogenic gas is sprayed on the food products or they are immersed into the gas in order to freeze them. 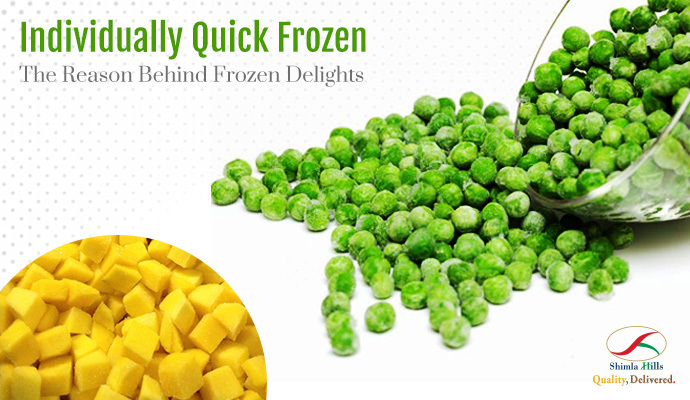 Why is IQF Preferred By Frozen Fruits and Vegetable Suppliers? There is the option of cold storage available with the producers and exporters of frozen food products. However, a majority of them prefer to use IQF because it takes very less time to freeze the products. In IQF, the membrane of the ice crystals is limited, thus it does not damage the membrane of the fruits and vegetables. Above all, when products are frozen in cold storage, they exhibit a considerable drip loss and ruined texture when defrosted. Also, it is quite difficult to keep the nutrients intact with the use of cold storage option. Shimla Hills, an eminent name in the agro-products industry, provide everything right from the diced, sliced forms to completely frozen IQF variety of fruits and vegetables. Some of our IQF offering includes Alphonso Mango Slices / Dices, IQF Guava Dices-Pink, IQF Papaya Dices, IQF Pomegranate Arils, IQF Coconut Dices, IQF Carrot Dices, etc. To get your hands on premium quality IQF fruits and vegetables, book your ORDER NOW!